By the end of 2017, having lived in California for 18 years, one of the things that I most enjoyed about return visits to the East Coast was the bread. To be clear, great bread is not difficult to find on either coast, or in between. But for my taste, the average East Coast bread is more consistently warm, crusty, toothy, delicious, and just more thoughtfully prepared and served. There is lots of speculation about the reasons for this. Is it all in the water? Is it a closer connection to old world European traditions? Is it the flour or the yeast? I sought answers from The Internets, most notably r/Breadit [reddit.com]. Like all internet subcultures, some themes and lingo appeared time and again. Discussions of sourdough cultures were pervasive, as were references to “Tartine” and “FWSY”, which I later decoded as Chad Robertson’s 2010 Tartine Bread [amazon.com], and Ken Forkish’s 2012 Flour Water Salt Yeast [amazon.com]. Creating a sourdough culture seemed like a good start, so I found a few online guides, mixed up some flour and water, and experienced several failed and/or moldy starts. Eventually, I discovered @maurizio’s [instagram.com] website, theperfectloaf.com. His excellent instructions set me on the path to creating a successful starter, which reached viability just as we were about to drive to Portland for the holiday break. So along with our luggage, I packed my neonatal starter, which I fed in the hotel bathroom during our first night away from home. Next stop, Powell’s City of Books, where I bought the copy of Tartine Bread that would be become well worn and dusted with flour in the coming year. We stayed in a VRBO apartment for a week, so on the day after Christmas, I formed my first two loaves, which proofed while we journeyed to Pok Pok for legendary Thai fare. When I attempted to turn the loaves out of their baskets, they stuck to the liner towels (note: dust with more flour next time), and were a sticky mess. Considering them a loss, I baked them anyway to see what would happen… To our amazement, they were shockingly good! First lesson: good bread is more fault tolerant than I expected. Starter: 50/50 AP/rye flour, 100% hydration. Replenished daily with about 20g of yesterday’s starter, 25-40g of water, and equal amount of 50/50 flour. Levain: 100g 80F water, 20g starter, 50g AP flour, 50g spelt. Ready in about 3 hours. Dough: 700g 80F water, 200g levain, 800g King Arthur bread flour, 200g Bob’s Red Mill spelt flour. Process: After 25 minute autolyse, add 20g salt and another 100g water. Bulk fermentation in the oven, heat off and light bulb on, door open a bit, maintaining an 80-90F environment. Four turns, one every thirty minutes, then one more after an hour. Split and form after another hour. 25 minute bench rest. Fold to develop tension and form final loaves. Then into baskets dusted with rice/AP flour blend, and into the fridge for cold bulk fermentation overnight. Bake: Place cast iron combo pans [amazon.com] in the oven, set to 500F and preheat for at least an hour. A pizza stone [amazon.com], covered in foil on the floor of the oven, acts as a heat sink. The built-in oven thermometer claims to be at 500F in less than a half hour, which is a lie. An Omega industrial thermocouple [omega.com] speaks the truth. When ready, remove the cast iron skillet from the oven, place the first loaf, score, return to the oven and cover with the lid. Drop the oven setting to 450F and wait 20 minutes. Remove the lid, avoid blast of steam, and bake another 22 minutes. Remove the loaf to a rack, and listen to crust crackling while resisting temptation to eat immediately. Return the cast iron to the oven, raise the oven temperature back to 500F, and wait at least 30 minutes before repeating for second loaf. Everyone asks if my starter has a name. Well, as she was born in the City of Roses, and in the spirit of “We Can Do It” [si.edu], she is Rosie. Every day, all but about 20 grams gets moved from her countertop Weck 743 3/4 Mold Jar [amazon.com] to a matching jar in the fridge. Then, I feed her 20-40 grams of a 50/50 blend of rye flour and all-purpose white flour, and an equal amount of water. I actually add the water first, mix to combine, then mix in the flour. After about a week, sufficient spent fuel has accumulated in the fridge to make pancakes [theperfectloaf.com], waffles [theperfectloaf.com], crepes [culturesforhealth.com], or sometimes cinnamon rolls [theperfectloaf.com]. Poster. “We Can Do It!” or Rosie, the Riveter. 1985.0851.05. Just about every weekend, I baked something, usually from Tartine Bread. By year’s end, a total of 42 episodes of bread production had been completed. It became a lifestyle. I also made the Tartine baguettes a few times, yielding elongated loaves of variable aesthetic quality, plus some dinner rolls (converted by scissors from the most #fail of the baguettes), and sometimes also pan fried English muffins. Many times, I rewatched Dan McTiernan’s YouTube instructions for shaping a baguette, and eventually achieved reasonable results. I also made the brioche a few times, best deployed as Glorious Hamburger Buns. Here on this very occasionally updated website, I have written a few times about my journey into the future of cars. We still own our 2012 Chevy Volt, a species soon to be extinct [wired.com] as GM is closing its factory and killing most of its sedans. In January 2017, I took delivery of one of the first ever Bolt EV’s, and wrote about my first impressions, which still hold true. But alas, I now write of the Bolt in the past tense, because it is no more. This is the story of how 2018 became my post-car future of cars. On the morning of May 21, 2018, I was heading southbound on I-680 on a clear day, in the usual morning traffic, and otherwise unremarkable conditions. I was hit from behind, hard. Time expanded. What just happened? I have definitely been hit. This is not good. I’m going to be late to the study in San Carlos. They’ll have to get started without me. Hope someone else brought a camera. I have to try to stop my car. There’s a Prius in front of me. I really don’t want to hit that Prius, because that would make this situation much more complicated. Oh, good, I’m already jamming on the brake. What the hell hit me, anyway? No time to check now, must continue jamming on brake. What is that clicking noise? It’s that sound that you hear if you engage the parking brake while the car is still moving. Oh, it must be the car trying to help. Thank you car, we are working on this problem together. Will we be able to stop before hitting that Prius? No. I guess not. But it’s just a little bump, though, not too bad. Thanks for sticking with me on this, Bolt EV. We are now stopped. On the highway. In the HOV lane. Today, the daily fiasco on 680 is: ME. Maybe we should move to the shoulder. All attempts to re-energize the car fail, as a series of dire messages pass across the dashboard screen. We have entered post-apocalypse failsafe mode. I exit the car, look around, and guy that hit me is wandering about with a bloody face, apologizing. His car is a disaster, mine doesn’t look too bad. Mostly unscathed Prius has pulled over to join in the festivities. I call 911. What follows is an ordeal of several months duration, which is hopelessly boring. Let’s just address the important points. First: PHILIP WAYNE GARZA of WEST ZEERING ROAD in Turlock, CA. According to the police report, which I obtained later, he had been driving erratically in the moments before hitting me, and his license was suspended at the time. He was going 65 mph or so, and I was slowing to about 30 mph. When I was taking pictures at the scene, he asked that I not take his picture, so I will not post it here. You’re welcome Philip Wayne Garza. $12,230.74: preliminary repair estimate, provided by the dealer recommended and insurance company approved body shop. May 25, T=+4 days. $32,020.84: settlement value, the valuation of the car determined by my insurance company. May 30, T=+9 days. $33,369.90: lease payoff value, determined by GM Financial. June 4, T=+13 days. 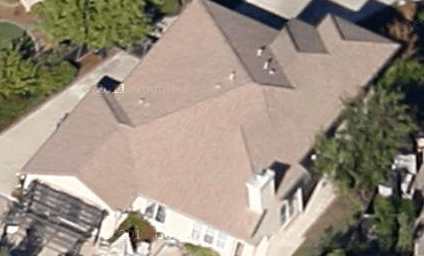 ($1,349.06): the difference between the settlement value and payoff value. Surprise, not in my favor. $2,006.12: Total sum of lease payments made in June, July, August, and September for a car that didn’t exist. ($501.53): Mysterious check received from GM Financial on October 29, in the exact amount of one lease payment, presumably because they decided they had enough of my money already. 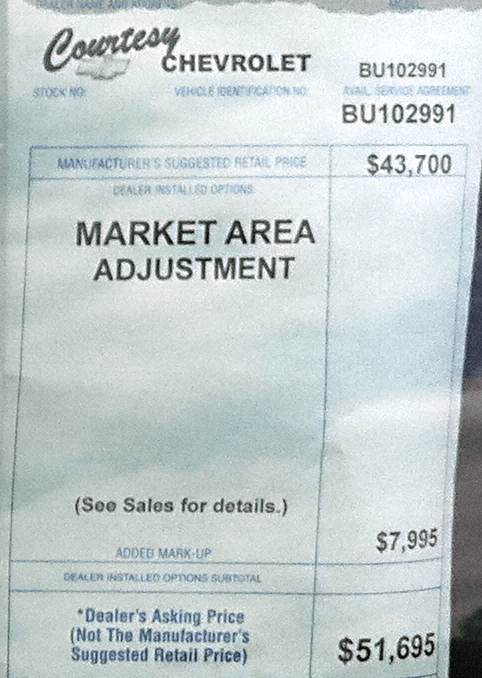 ($268.27): Mysterious check received from GM Financial on November 7, presumably because the “GAP claim” was resolved. T=+170 days. ($250.00): Refund of the deductible from my insurance company, presumably because (?) I don’t know why. Subtract those three numbers from the first, and $986.32 is the punitive amount I ended up paying GM Financial after 170 days of opaque and conflicting non-communication, accounting for insurance and GAP payments. Thanks, GM Financial, for this reminder of why you are a horrible person. I was in Europe for two weeks shortly after The Incident, and tried to buy a replacement car from afar during that time. An exact replacement. Unfortunately my reliable sales guy had vanished. And let’s just say that Chevy dealers are not equipped to handle the circumstance of a customer who wants to purchase a specific car, in exchange for actual money, via email. By the time I returned from the EU, having spent two weeks traveling by train, metro, and bus with the greatest of ease, I decided that I didn’t want a car. Instead, I set out to see just how terrible the Bay Area public transit system really is. In summary, it is bad. However, its competition is the infuriating hellscape of a daily commute on I-680 between Pleasanton and Fremont. For a few years, I’ve been using LifeCycle [apple.com], an iPhone app that magically tracks time spent on various activities, including my commute. I exported and analyzed the data, and found that it agrees with my intuition: my transit commute takes about 50% longer on average, but the highs and lows are not too much different. By the end of 2018, my average transit expense was about $220/month, less than half my monthly lease payment. This average benefits from some zeros, because (unlike my lease payment) my transit expenses are much lower when I’m traveling for work. Six months into this experiment, my desire to have a car is less than ever. I have outsourced my transportation needs to BART (a.k.a. “The Tetanus Train”), ACE, Wheels, AC Transit, and Lyft, and I don’t want my driving job back. I shall continue collecting data in 2019, and maybe I’ll report back in another year or so! In the past two weeks, I’ve been on nine flights, through seven airports in six countries, and I’ve slept in six different hotel rooms. Strange as it may seem, my busy travels have allowed for unusual stretches of uninterrupted time to think and reflect. Six to nine time zones away from my family, we didn’t have much time to talk, so a backlog of stories began to accumulate in my mind. Inspired by a friend’s good habit of writing journals when he travels to exotic locales, I started writing in the evenings, and found it to be a relaxing practice. During the trip, I met with clients, attended a conference, visited the Sicilian village of my great-great-grandfather, and the political structure of Europe had fractured possibly beyond recognition. I find that writing helps me to think, and there has been lots to think about in these two weeks. When I got back to the US, I decided to try a self-publishing experiment. I created a book layout using the typesetting system LaTeX [wikipedia.org], a strange and powerful markup language that I’ve been using to write proposals and reports in the last few years. From that, I created a print-on-demand version of the book using Amazon CreateSpace, and a Kindle version following the advice of Scott Nesbitt [scottnesbitt.io]. Instant book, published in print and online in about a day. I think Gutenberg would agree: we are living in the future. Photos from my travels are in the Finding Lorenzo [flickr.com] album. There isn’t much that is “open” in the proprietary world of medical device design and development. Designs are guarded, competition is spirited, employees and vendors are bound by strict non-disclosure agreements. Yet for all the varied and confidential pursuits that we undertake in this industry, we all have at least one interest in common: human anatomy. Everything we design travels through, or is placed within, some part of the human machine. A machine so ubiquitous that while I am using one at this very moment, most of you are as well at this same moment. And yet despite eons of medical study and inquiry, collaboration, and publication, it holds its secrets in plain view. The blueprints for this most essential of machine are strangely out of reach. We can freely download 70,000 technical drawings and 3D CAD models for nuts, bolts, and mechanical components from McMaster Carr [mcmaster.com], but they don’t sell body parts, so no luck there. There are great sources for viewing 3D anatomy, like ZygoteBody.com. But if you want to download native 3D files, you’re going to have to pay. 3DScience.com sells medically accurate models for animators, illustrators, and engineers. They cost hundreds or thousands of dollars, and they’re probably worth it. The good folks at Pacific Research Laboratories [sawbones.com] can sell you dimensionally accurate polymer based models for product testing or demonstrations, as well as 3D CAD files representing them. These things are great, but they are neither open nor free. Modern medical imaging, including CT and MRI scanners, provides a wealth of 3D data, but it isn’t easily translated into a form that is useful for engineering. Commercial software like Mimics [materialise.com] does a nice job of this, again for a price. OsiriX is an awesome open-source program for viewing medical datasets, and with considerable effort, it is possible to extract 3D structures in a format that can be used for engineering (example described in an older post, but I really should write a new post some day with details on how to create such models). OsiriX hosts a number of example DICOM data sets [osirix-viewer.com], which are treasure troves of freely accessible digital human anatomy, for anyone ambitious enough to try to extract it. I recently discovered the NIH/NLM Visible Human Project®, which is a public effort to develop “complete, anatomically detailed, three-dimensional representations of the normal male and female human bodies”. (The ® seems suspicious for an NIH project, doesn’t it?) The project and related initiatives, underway since 1989, have produced many gigabytes of data, and I’m sure have entertained countless scores of grad students and post-grads. But unless I’m missing something, I can’t find any publicly available 3D solid or surface files derived from these impressive data sets. (update: the University of Iowa hosts male and female Visible Human data sets [uiowa.edu]) Refusing to be deterred though, I Googled obsessively until I hit paydirt, in an unexpected place: The Journal of Nucleic Acids Research. The project was funded by The Integrated Database Project, Ministry of Education, Culture, Sports, Science and Technology of Japan. (Arigatō!) The website alone is quite impressive, and is even translated into English (see http://lifesciencedb.jp/bp3d/?lng=en). But this project goes beyond just displaying pretty pictures… The native 3D models for thousands of carefully rendered body parts are made freely available under a Creative Commons Share-Alike license! And they can be downloaded from an FTP site, in high resolution! Finally, a complete source of 3D digital human anatomy that is freely available, accessible, and suitable for use in with solid and surface CAD software. From Japan! The files are available in Wavefront OBJ format [wikipedia.org], which can be imported as a 3D surface into CAD software like SolidWorks, finite element analysis (FEA) software like Abaqus or Ansys. These files can also be manipulated in open-source programs like Blender [blender.org] or Meshlab [meshlab.org]. Either of these can also easily convert the .OBJ files into .STL files that can be printed on a 3D printer! Like a kid in a candy shop, I’ve created a few of these already, and hope that others will create more. Here’s the basic procedure that I used. Download and unzip the OBJ files. The originals are at ftp://ftp.biosciencedbc.jp/archive/bodyparts3d/, but I’ve made a copy (as permitted by the CC-SA license) in case the originals disappear, and to avoid taxing their FTP server in case this gets popular (which I hope it does!). You can grab my copy of the 547MB zip file here: BodyParts3D_3.0_obj_95.zip [docs.google.com]. Find the FMA number of the body part of interest. You can do this using the web interface at http://lifesciencedb.jp/bp3d/?lng=en or by searching the English version of the the parts list (parts_list_e.txt inside the zip file). It helps to know something about anatomy, of course. It also helps to know that many of the FMA numbers on the list refer to groups, rather than individual parts. For example, FMA9664 “foot” contains FMA70664 “set of toes”, which contains FMA25047 “big toe”, but you will find none of them in the list of .OBJ files. Instead, you need to find FMA230986 “middle phalanx of right little toe” and 27 other bones if you’re trying to build a complete skeletal model of the right foot. Create a new empty project in Meshlab, and import one or more .OBJ file of interest. Each .OBJ will be on a separate layer in the project, and Meshlab doesn’t make it easy to figure out how to work with layers. Hint: Filters > Layer and Attribute Management. Save the Meshlab project at this time if you think you might want to do some more work later. Merge all visible layers into one. Filters > Layer and Attribute Management > Flatten Visible Layers. Save the mesh as an STL file. File > Export Mesh > select .STL as type. Close the project without saving to preserve the layer organization for each component. In the parts window at the upper right, delete the part of the cut to throw away. If offered the opportunity to repair the geometry, do so! Prepare for printing using your tool of choice. I’m partial to Cura [github.com], which I use for everything. The majority of my driving is a 34 mile round trip, easily less than my fully charged range, which varies between 35 and 42 miles. About a third of the gasoline powered miles can be attributed to long distance road trips to Pinnacles (200 miles) or Los Angeles (750 miles), and the rest are day trips around the Bay Area. 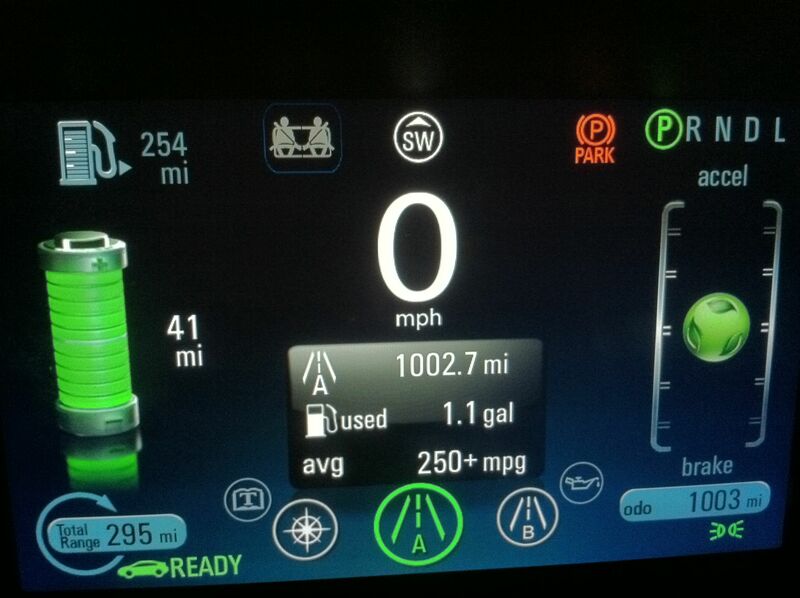 I’m happy to report that the Volt has been solid and reliable. It’s fun to drive in the future! The number one question that people ask me about owning a Volt: “So how much has your electric bill increased?”. The answer is “its complicated”. The cost of electricity varies with usage, varies with the season, and with EV specific time-of-use rate plan that I switched to when I bought the car, it also varies with the time of day, and day of the week. 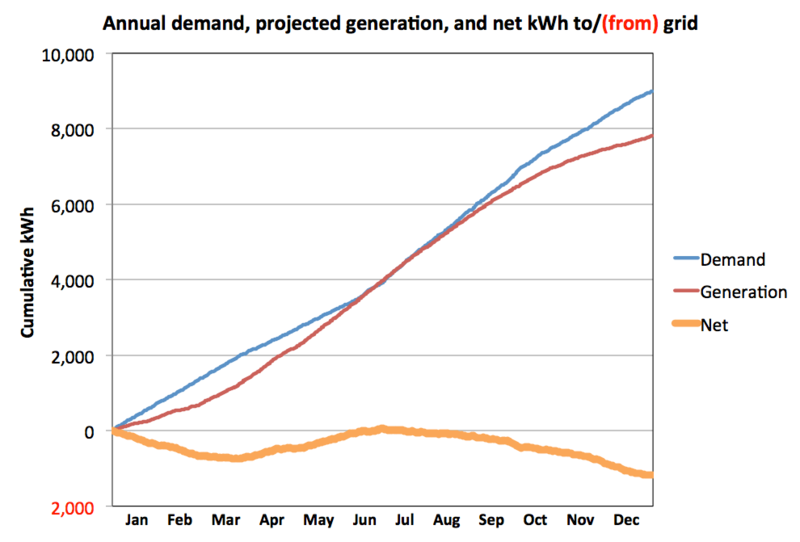 So the true costs of electricity need to be evaluated on the basis of a full year. Comparing a full 12 months of electricity costs before owning an EV with the same 12 months after buying an EV, the final score: $801/year before the Volt, and $1,564/year with the Volt. So that’s an increase of $762, roughly doubling my electric bill. So if my electric bill doubled, does that mean that my electricity consumption doubled with the car? Far from it. Home charging the car for a year added about 2,800 kWh, or about 233 kWh per month. That’s about a 50% increase over normal household consumption. Are my electric rates skewed because of high household electricity consumption (from air conditioning, or other variable demands)? No. The average annual electricity consumption in California was 6,296 kilowatt‐hours (kWh) per household in 2010, according to the 2009 California Residential Appliance Study conducted for the California Energy Commission. 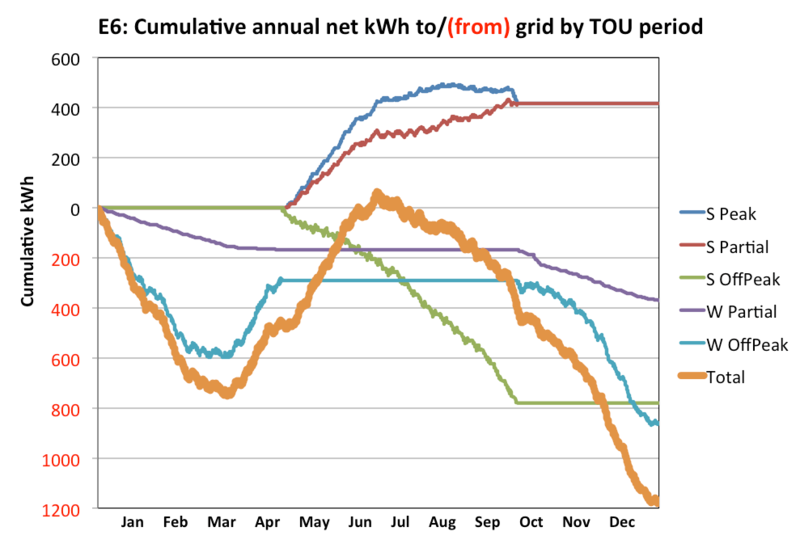 The chart below shows my household consumption, excluding EV charging, for 12 months before and after buying the Volt. This makes it clear that my normal household electricity usage is far from excessive, and in fact is less than average. Excluding EV charging consumption from this year, annual electric consumption is virtually identical to last year. So what are the true effective rates? Well, in the twelve months prior to owning an EV, my average rate under the standard E1 residential rate plan was $0.14/kWh. 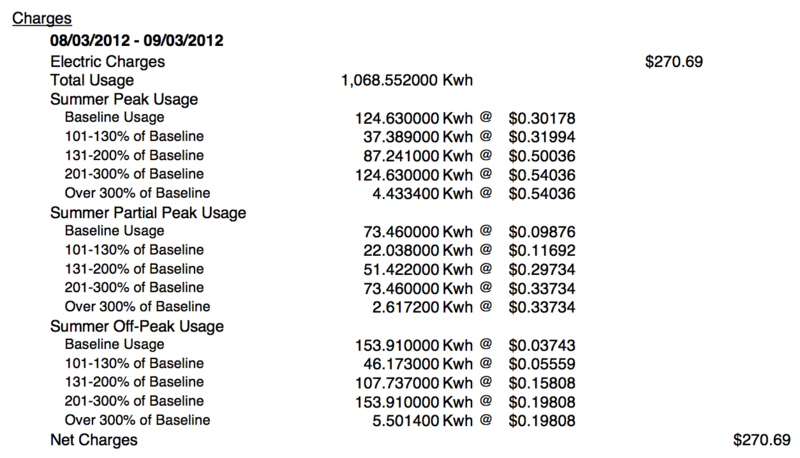 In the following twelve months, under the E9A time-of-use rate plan, my average rate increased to $0.18/kWh. 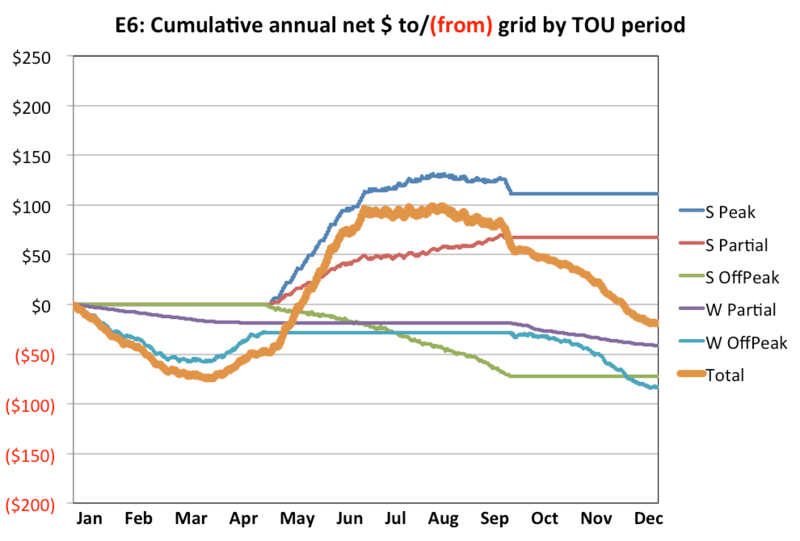 From the chart below, its clear that in the winter months, the E9A plan offers effective rates that are equal to or lower than last year’s $0.14/kWh. In the summer months, though, rates are substantially higher. The EPA energy costs on the window sticker of a Volt assume the national average of $0.12/kWh, so the $0.18/kWh effective rate in PG&E’s California is 50% higher than the national average. It would be higher still if my household demand were higher than average, or if (gasp!) I owned a second EV. So what’s the bottom line? 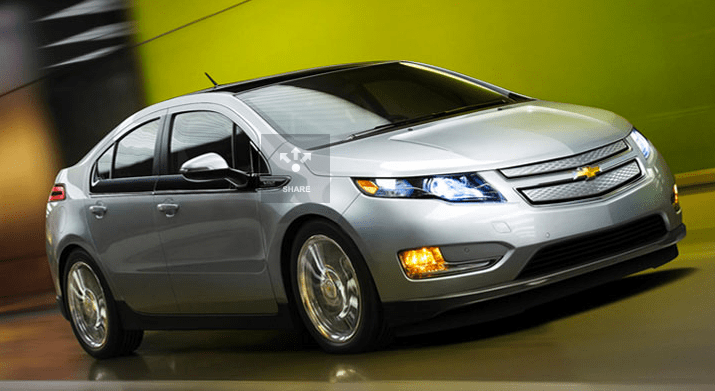 How do the energy costs for a Volt compare with the gasoline costs of a conventional car? Well, that depends on the car used for comparison. 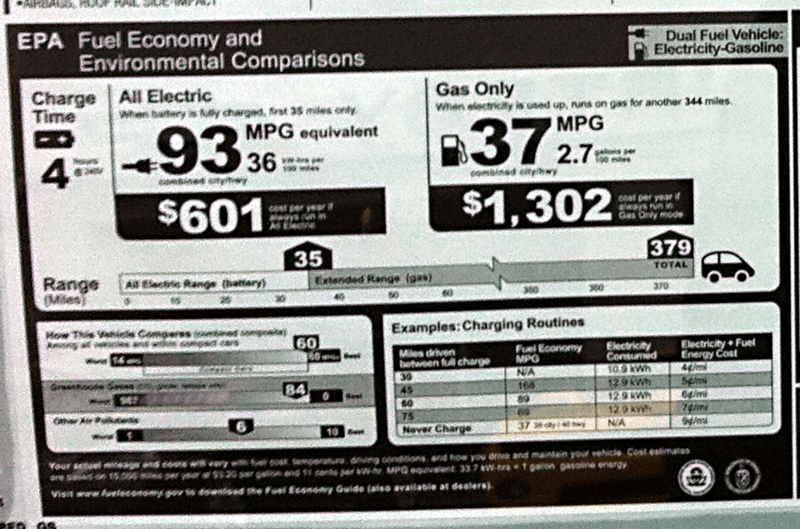 My previous car required premium gas (as does the Volt) and averaged 24 mpg during the years that I drove it. Using California monthly average premium gasoline prices from the California Energy Commission, gas for my old car would have cost $2,167 for the 12,100 miles I drove in the past 12 months. That’s $18/100-miles. For the Volt, during this period, I used $293 in gas, and the incremental cost of electricity (compared with the previous year) was $767. So that’s a total of $1,059 in energy costs for the Volt, or a annual savings of $1,108. At $9/100-miles, that’s almost exactly half the energy costs for a 24 mpg conventional car. The chart above is strange. The slope of the Volt cost curve flattens out from 2,500 miles to 7,500 miles, which happens to correspond to the winter months. With E9A rate plan, the Volt energy advantage is much more impressive in winter, when a Volt operates for about 1/3 the cost of a conventional car. 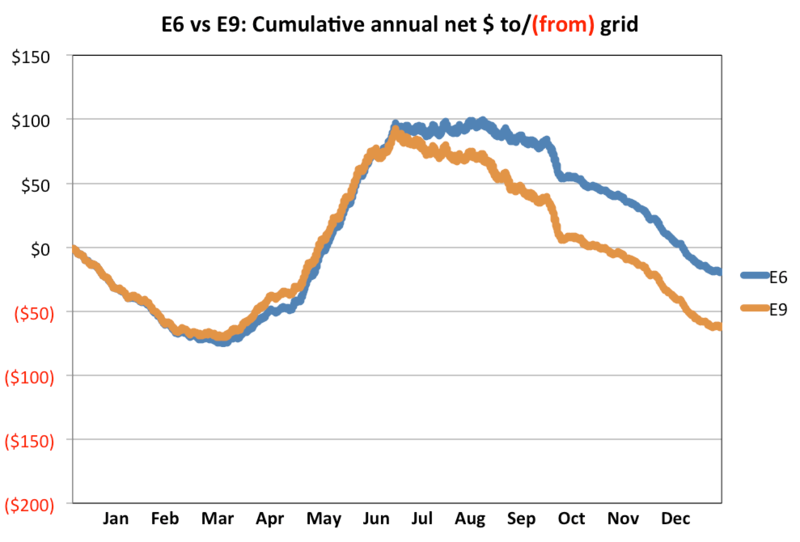 In the summer, the advantage is less impressive, with energy costs reaching 2/3 the costs of gasoline at times. With a year of data in the bag, I can get a better understanding of the costs and benefits of a solar system. This introduces yet another time-of-use rate plan option, as I described in Decoding Time of Use Rate Plans. And to make things even more interesting, PG&E plans to retire the crazy E9A rate plan, and replace it with a different crazy EV-A rate plan. The new plan was originally proposed in September 2011, and met with dozens of protests, including one from me. PG&E responded with a somewhat less objectionable proposal, which appears to have won support of the CPUC. Jack Lucero Fleck has followed these matters closely, and has a written a nice summary of the current PG&E proposal, and a letter to the CPUC with additional analysis. We’re at the dawn of an electrified revolution that will have a profound impact on auto manufacturers, electric utilities, and the fossil fuel industry. Prospective EV buyers, and current EV owners face a shifting landscape, and considerable uncertainty about the true costs of energy. Governments and regulated utilities will stumble forward toward the inevitable future. It will be an interesting journey. I’ve been in the future for a year now, and complicated as it may be, I’m not going back! The full year data and source charts from this post can be viewed in greater detail as a Google Spreadsheet. Comments, criticisms, and suggestions are welcome! I first saw a MakerBot Thing-O-Matic in action at the 2011 Bay Area Maker Faire, and it was truly a thing of beauty. I’ve used rapid prototyping machines and services since the mid 90’s, but here was something that you could build yourself, and have on your own desk! Wow. Later in the year, I happened to have a free day in New York during the NYC Maker Faire, so I was drawn to revisit this hacker dreamscape. There, I met @ErikDeBruijn, one of the developers of the Ultimaker: an elegant build-it-yourself 3D printing machine capable of relatively high speeds, stunning resolution, and a comparatively large print volume. I became immediately obsessed with visions of 3D printed anatomical structures, and medical device prototypes. I asked Erik if the Ultimaker was being used commercially, and he knew of a few customers that were using it in schools, and at least one other that was offering a service making 3D prints by the hour. Medical device development, not so much. That only made me more interested. Later that day, I saw a great talk by Bre Pettis (@Bre) of MakerBot fame (30 minute video on Fora.tv). An icon of the open source hardware movement, Bre gave lots of examples of digitized “things” that are freely shared on sites like Thingiverse, where users can upload, download, share, modify, and combine digital objects. And now print them out, too, effectively “teleporting” physical objects among like minded citizens of the internets. Digital “mashups” of Yodas, Gantstas, and Rabbits delighted the maker-faithful in attendance, while evoking dismissive comments from the guy sitting behind me: “What’s the point?” Dismissive guy, and many like him, see a toy. Which it is. But its more than a toy. If you’re not sharing, you’re doing it wrong! If you’re at a company, and keeping things secret… Stop it! Publish those things (even if they’re not done, or done done)… Just share them, because so much of the future depends on it. These are the noble words of an open source evangelist, and the principles upon which Linux, Firefox, Wikipedia, Arduino, and countless other open source projects depend. And then there’s my professional universe of medical device design and development. An industry that relies upon proprietary designs, trade secrets, secure patents, guarded intellectual property. The opposite of open. And yet, everything that we do in my industry is directed at improving the human condition, which is very much in the common interest of all humans. Is there a way to be “open” in a “closed” industry? It isn’t easy. I wrote about the opportunity and challenges in Open Medsystems a few of years ago. Medical device development is expensive, and it generally isn’t going to get funded unless the investors have some confidence that they can profit from their investment. So NDA’s will be signed, secrets will be kept, patents will be filed, and knowledge will be sequestered. Brilliant engineers and designers will face the same challenges, each alone in their own respective proprietary silos, not knowing of their kinship, not benefiting from each other’s ideas or mistakes. In the end perhaps one will win, or both will lose. But there is hope. I’ve tried to do my part by publishing Open Stent Design on NitinolUniversity.com, releasing Stent Calculator on Google Code. But I think there’s a bigger “open source” opportunity for the medical device community, and I’m not alone. 3D medical imaging technologies, like CT scans and MRI’s, have made amazing advances in the last decade. These increasingly ubiquitous machines create torrents of 3D data sets, each a unique atlas of human anatomy, and each an exquisite three dimensional map of a diseased system, organ, or tissue. These medical imaging data sets hold secrets waiting to be discovered -they describe the environment in which medical devices must do their healing work. 3D imaging data, usually in DICOM format, is easily anonymized, and easily rendered and manipulated with open source software such as the excellent OsiriX [osirix-viewer.com]. Translating medical imaging data sets into useful 3D geometry for analysis or simulation is messy work (see segmentation [Wikipedia]). But it is important, and at least one group is working on developing a Cardiovascular and Pulmonary Model Repository [VascularModel.org] to do just that. Sponsored by NIH, this effort will collect medical imaging data sets for several body systems, perform segmentation, and make the raw data and analysis available to the public. Freely available 3D anatomical data + open source 3D printers = freely available (plastic) body parts! Rapid prototyping of proprietary 3D data is nothing new in the medical device development world… but 3D printing of freely available anatomical models derived from freely available anonymized medical imaging data is all kinds of awesome! 3D printed blood vessels, organs, and bones can be used to mold or cast realistic benchtop models, which can be used to test and challenge medical device concepts in a realistic environment… Or better yet, many realistic environments, reflecting the many individual humans they are designed to help. And that is some true open-source mojo at work in a closed industry, to be benefit of all. So after honing my Ultimaker skillz on snakes, whistles, cars, and alien eggs (“What’s the point?”), I have turned my attention to the beloved OsiriX DICOM Sample Library [osirix-viewer.com], and tackled the aortic bifurcation of the AMNESIX model. After some quality time with OsiriX, I had a rough export of the aorta and iliac bifurcation, which I then cleaned up in MeshLab [meshlab.org], sliced using Netfabb [netfabb.com], then printed using ReplicatorG [replicat.org]. And though it isn’t final, done, or done done, it is now shared as Thing:15942 on Thingiverse! At the beginning of the month, I changed my service plan from the standard issue PG&E E1 residential rate plan to E-9A, a “time-of-use” plan designed for customers who charge electric vehicles at home. With this plan, rates are higher during peak times, and lower at off-peak times, thus providing a good incentive to charge up the car at night when demand on the grid is low, and there is plenty of generation capacity with electrons to spare. Complicated as this is, the Volt allows me to program in all of the rate details, and it figures out when to charge itself. Until this month, I was able to use PG&E’s website to download daily and hourly demand history from my SmartMeter. Now that I’ve switched to a plan where this hourly usage data actually matters, it is no longer available. Thanks PG&E! So I will not know the true costs for this plan until I get the first bill in a few weeks. 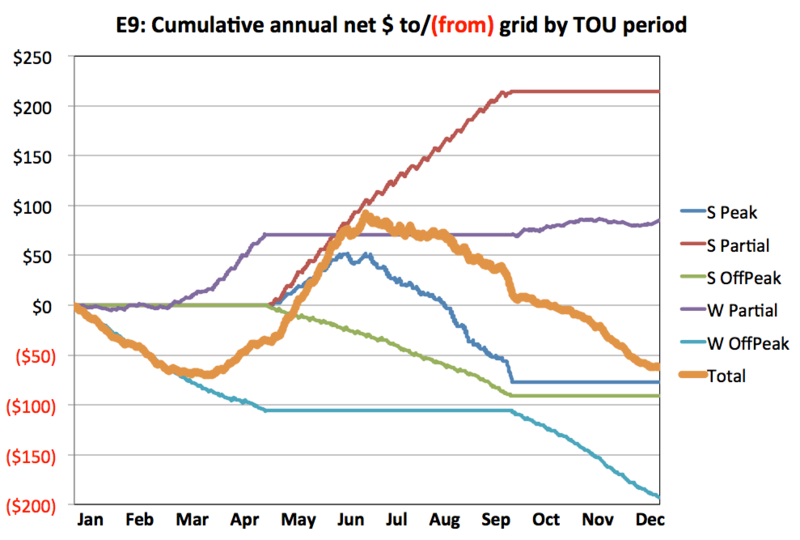 Just the other day, a forum post at gm-volt.com caught my eye: Major change in PG&E CA E9 TOU rates. It seems that PG&E proposed some “helpful” changes to the E9 plan on September 26, 2011. In Advice Letter 3910-E, they propose a new rate schedule. According to this letter, the changes will cause an overall increase in payments for 3/4 of the customers on the E9A plan. Since I had gone to the considerable trouble of Decoding TOU Rate Plans not long ago, I decided that it was time to dust off my spreadsheet and calculate the impact of the proposed change for my expected usage. The perplexing result of this effort confirmed the same surprising conclusions of some other PG&E EV customers: the new E9 plan is substantially worse than the old E9 plan, and is actually the same or better than the standard E1 plan. The results of one year of simulated use is depicted in the figure below. 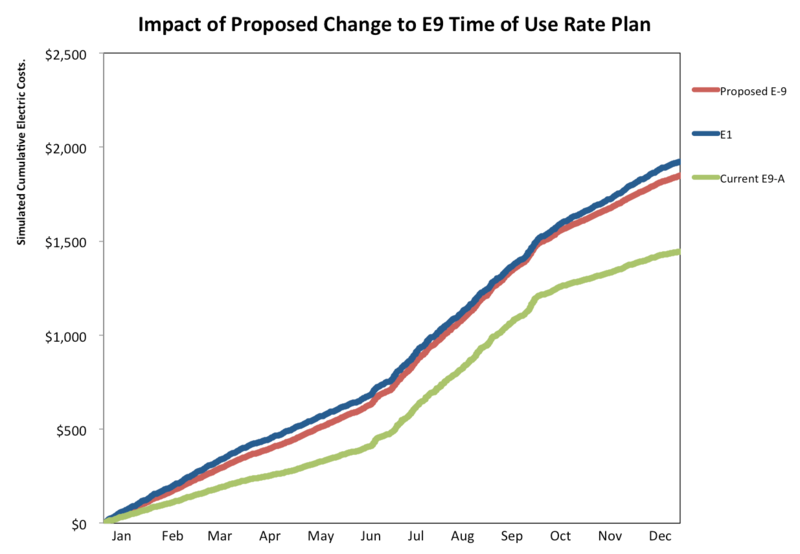 Comparing current and proposed E9 time-of-use rates with the standard E1 plan. If my situation is typical, these "helpful" proposed changes will render E9 useless, drive customers to stay on E1, and eliminate any incentive for EV owners to charge at off-peak times. PG&E’s proposed change makes the E9 plan useless: EV owner will have no reason to choose a time-of-use plan, and will have no economic incentive to charge at off-peak times. This change seems to be completely counter to the public interest, and to PG&E’s own best interest. Go figure. Here’s a link to my spreadsheet for calculating simulated annual billing under various confusing and convoluted rate plans. I think it’s reasonably accurate, but who knows. If you find it useful, or can make any improvements, please drop a comment here. UPDATE (10/9/11) The Numbers Are In!